Boots are some of your most fashionable shoes, yet they're also some of the toughest items for college to store. If you just toss them in your college closet floor, well that can't be very good for them. Boots are best stored so their shape can be maintained. Doing so requires some special dorm storage items like this Hanging Boot File. It's truly an innovative dorm room organizer, as it can hold six pairs of boots. You might think there's no space-efficient way to keep six tall pairs of boots in your college dorm. As you can see, this dorm closet organizer is all you'll need. 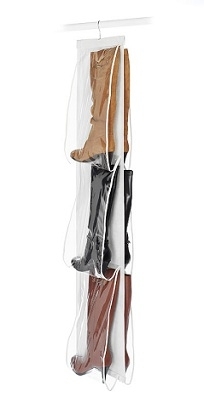 These clear vinyl protectors will allow boots to maintain their shape while keeping them clean and in great condition. Dorm closets can be rough on some clothes, especially because college closets get so crammed. At least you can be assured those boots will receive grade-A treatment while they're hanging in that closet. Your closet supplies for college aren't complete without some hanging organizers, and if you have more than one pair of boots, this hanger is an essential dorm supply.